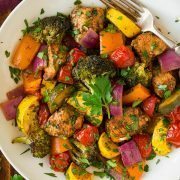 This One Pan Balsamic Chicken and Veggies couldn’t get any easier, plus it’s healthy and brimming with delicious flavor! This is one of those 20-minute meals that is sure to satisfy. The flavor of this one pan chicken and veggies is spot on delicious, and it has just enough versatility going on to keep things interesting. And the flavor? With the word balsamic in the title you know it’s got to be good right? 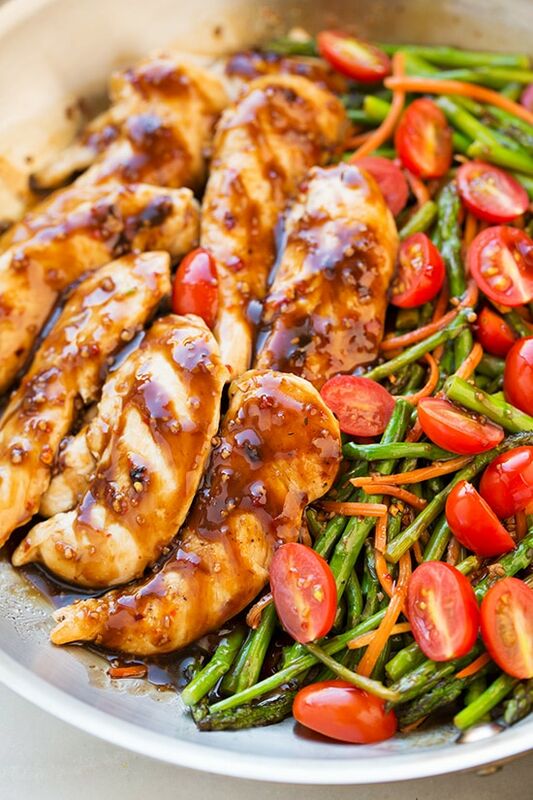 This balsamic chicken is so good! Who knew a dinner that was so easy could taste so incredible? This is a dinner or lunch I’m definitely adding to my rotation. I loved everything about it, the flavor, appearance, simple prep and of course the easy clean up! All around win with this one! 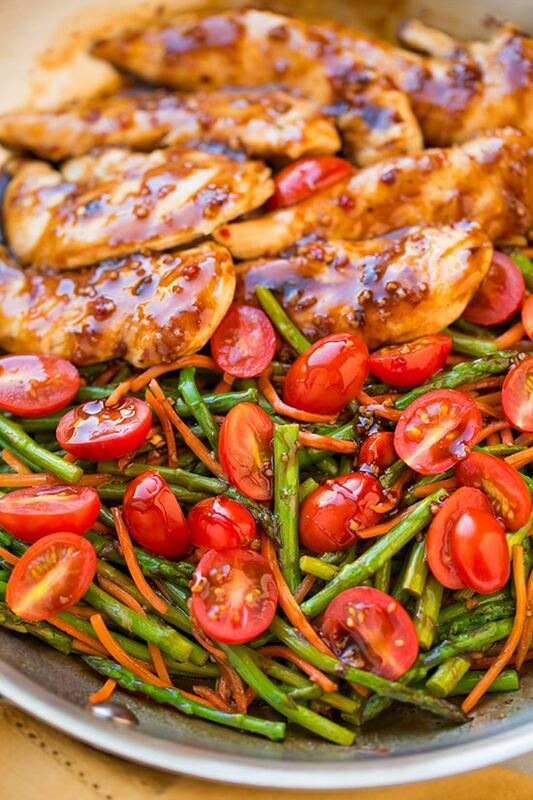 Want to see how easy this one pan balsamic chicken is? Watch the video! This balsamic chicken recipe uses easy to find, fresh and healthy ingredients that taste fantastic. I love the fact that this meal is ready in under 30 minutes making it perfect for weeknights! Whisk together salad dressing, balsamic dressing, honey and red pepper flakes. Season chicken with salt and pepper and cook 6 – 7 minutes in a skillet. Add half the dressing mixture to the skillet and toss to coat. Remove chicken from skillet and set aside. Then add carrots and asparagus to the skillet and cook until crisp tender. Transfer veggies to the plate of chicken, then add remaining dressing to skillet and cook until thickened. Add tomatoes to plate with chicken and veggies, then toss everything with the dressing in the skillet. Yes, you just may have to adjust the cook time for this recipe slightly. You want to make sure the chicken is fully cooked through before removing it from the skillet. Does it Matter What Type of Italian Dressing I Use? Any Italian dressing should work! And if Italian dressing is not sold at your grocery store, a homemade version can be used instead. 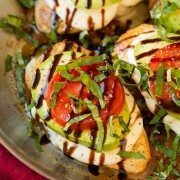 Can I Use Different Veggies in This Balsamic Chicken Recipe? Yes, feel free to use whatever vegetables you have on hand. Just remember that you may have to adjust the cook time depending on what veggies you use. Look for thinner stalks of asparagus. Not only will they cook faster and more evenly with the carrots, but they’ll also taste better (if the thicker ones are all they happen to have, they will work okay too). I recommend using the Kraft light dressing with this recipe, because it has a thicker consistency than most Italian dressings, which will help the dressing coat the chicken and veggies better (and bonus: it’s skinnier than the traditional oil heavy versions). 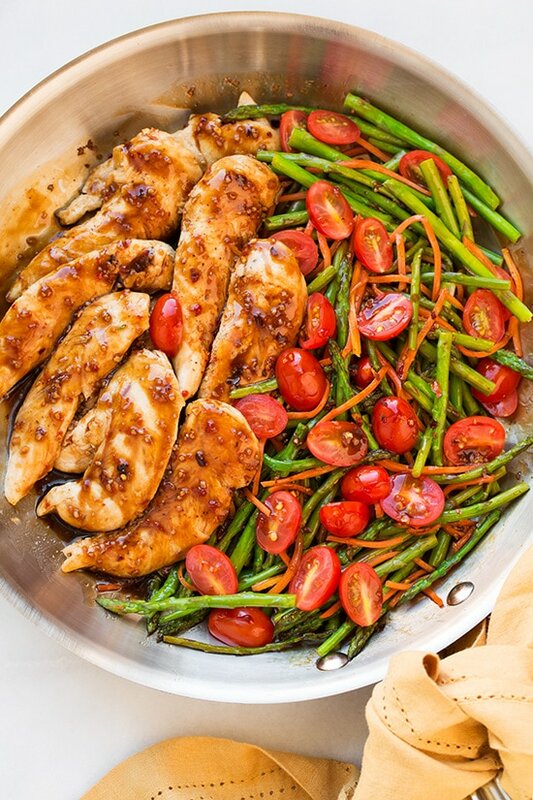 This One Pan Balsamic Chicken and Veggies couldn't get any easier! This is a a 20 minute meal that is sure to please! Heat olive oil in a 12-inch skillet over medium-high heat. Season chicken with salt and pepper to taste, then place chicken evenly in skillet. Cook about 6 - 7 minutes, rotating once halfway through cooking, until chicken has cooked through (meanwhile, chop asparagus and tomatoes). Add half the dressing mixture to skillet and rotate chicken to evenly coat. Transfer chicken to a large plate or a serving platter while leaving sauce in skillet. 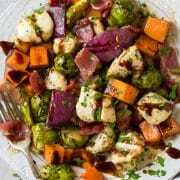 Add asparagus and carrots to skillet, season with salt and pepper to taste and cook, stirring frequently, until crisp tender, about 4 minutes. Transfer veggies to plate or platter with chicken. Look for thinner stalks of asparagus. Not only will they cook faster and more evenly with the carrots, but they'll also taste better.